Tossing It Out Tossing It Out: Battle of the Bands: Handel's "Hallelujah Chorus"
After the Battle of the Bands (BOTB) took a turn for Christmas music in December I decided to join in the merriment to add my own picks. 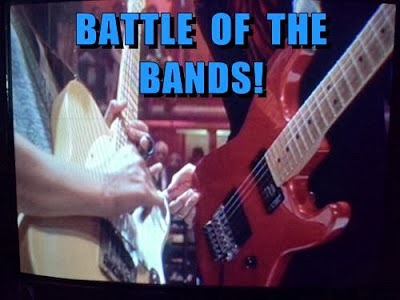 If you're just joining me for a Battle of the Bands installment, you can find out more about it by visiting the sites of the founders at Far Away Series and Ferret-Faced Fascist Friends. Somewhere on those sites you'll get the scoop on BOTB and you can vote on the match-ups they chose. I left a trail of clues leading to my pick for round #9 of BOTB. Since I'm composing this entry ahead of time I don't know if anyone guessed my pick. I think my clues were pretty blatant though perhaps not obvious. As usual I relied on using lyrics embedded into my posts and this time I even used a homonym for the composer's name. So if no one did guess, my pick for this battle is "The Hallelujah Chorus" from G.F. Handel's Messiah. Every Christmas season groups around the world perform the entire oratorio or at the very least the "Hallelujah Chorus". Messiah is also often performed at Easter as well as other times of the year. It's a great classical work that is among the most recognized of all. My reason for using this selection is because on the afternoon of Sunday December 1st I'll be performing most of the Messiah with the L.A. Oratorio Chorus and Orchestra. Sounds impressive doesn't it? Actually we're something like 50 voices and a small orchestra of about seven instruments. Last year we performed with only a piano and it was pretty stirring from the feedback I got from those in attendance. We've been rehearsing this one day a month since January and I think we'll do a bang up job with it. I'm especially excited about having the instrumental ensemble backing us this year. I'm using three clips for this installment. The first is a performance by chorus and orchestra as it was intended to be performed. I offer this for anyone who is not familiar with this piece or in case you'd just like to hear it again. One of the pioneer groups of Christian Rock is Petra. Here is a clip which is a part of a larger medley they performed for the concert album and video Captured in Time and Space. In my opinion frontman Greg X Volz is one of the greatest rock vocalists ever. Check out what he and the band do with Handel's piece. I only wish they had done a longer version. By the way this is an excellent concert video for those who enjoy this style of music. Now Vote for Your Favorite! Do you prefer the Oak Ridge Boys? Did you like what you heard from Petra? Or are you a traditionalist and go with the classic version? Cast your vote in the comment section and tell us why you chose as you did. And if you feel inspired to contribute your own Battle then let us know if the comments so we can visit yours. Do you ever perform with a choral group that does Handel's Messiah? Have you ever attended a full presentation of the Messiah? Do you enjoy this type of music? Hi Arlee, It's a tough choice. The bass in oak ridge boys is impressive, and Petra is proof positive that rock music is a reinvention of classical music. But I'm voting for the first. No matter what genre of music you like I think almost everyone can appreciate the original. Takes me back to my childhood days of Mum cranking up the record player and humming to her favourite classic tunes, it is simply timeless. Difficult choice Lee. Funny though because one of my favourite professional wrestlers uses a slightly remixed version of the original and I would say it's my favourite! The first is indeed a classic and how it was intended to sound. That said, the Petra version is fun and energetic. It reminds me of Trans Siberian Orchestra, which can do the classics like nobody's business. And of course, Petra was big back when I was in high school and college. So my vote goes for Petra. Hi, Arlee. I'm going to go with the Hallelujah Chorus from G.F. Handel's Messiah. I didn't know you sang! I have the Messiah on LP and have listened to it but Hallelujah is the best track on it. I do love classical music but I grow weary of solos and arias. I love the full on chorale singing. My fave would be Mozart's Requiem. The only chorale group I belonged to was in high school my senior year. Right before Christmas we performed Vivaldi's "Gloria" at a beautiful old church in my hometown of Sandwich, accompanied by the Cape Cod Symphony Orchestra. It was really fun. Ida -- I agree that the "Chorus" and The Messiah are timeless works of music. Yeamie -- A vote for the "wrestler remix". Okay. Alex -- Petra did some excellent music. Susanne -- A vote in the traditionalist vein. JoJo-- A vote for the Mozart Requiem. Hey! Wait a minute! I went in wanting to like the Mighty Oaks version, and I did at times. But the beginning was too poppy for them (IMHO)and colored the rest of it for me, although the layered parts did redeem it somewhat. I do like Petra. More Power To Ya is one of my favorites of the genre, and made it onto my Great Eighties Countdown (or seventies, one of the two). But the way THAT CLIP started made me think the recording had a speed problem. So, I guess I'll take #1. Some things should be enjoyed pure anyway. 'Hallelujah Chorus' from G.F. Handel's Messiah gets my vote. I don't like the Oakridge Boys version, not fond of modern remakes of old classics. I'm a purist in my music likes, and will generally prefer the original to ANY covers. Good luck with your own group, Lee! I thought the two modern takes were pretty cheesy at best. The orchestration on the Oak Ridge Boys number actually made me laugh. You can certainly tell what decade that album came out! I don't think I could vote for either in good conscience. This is a song that really needs a classical arrangement. I love The Oakridge Boys to begin with. So of course I'm partial to their version. However, the other ones are beautiful also. I really like Petra's version and I agree with you about his voice--he's got great singing chops. I'm going for the traditional one. I think the season has started making me feel the need to stick with the classics in a lot of things, including music. While I like the attempts on the modern takes, this is one where tradition wins out. Who is the chorus/orchestra (if you said, I missed it). This is a song that is meant to be performed by a choir. That is soooo apparent in the traditional version. The Oak Ridge boys had me cringing with their pronunciation of "Hallelujah." It was just WRONG. And it sounded hick. Just terrible, which is a shame because the bass could really make those low notes resonate. I had Petra's More Power To Ya back in the 80s and really like the group... but not on this song. I guess that makes me a traditionalist. And, btw, I did guess The Hallelujah Chorus for this battle back on your Against the Grain post. CW-- The Petra clip pretty much sounds like it does on both my LP and video versions. I think the speed is okay. DG -- Classical music can be difficult to bring to modern standards. Donna -- I'm counting your vote as one for the Oaks. Jagoda -- I'm putting you down for Petra. C.Lee -- Things can start getting pretty out of hand at this time of year. Old fashioned sentiments are craved by many of us. Larry -- I actually don't know who performs the traditional Messiah in this clip. I don't think they are given credit on YouTube. Robin -- I do believe you were the sole correct guess and on the first day yet. Good catch on the clues. I vote for the first, the classic version. It kinda feels as though, like a class movie, it shouldn't have been redone. The only other song I thought you MIGHT have had in mind I won't mention by title as I might be using it myself later. I've always been a sucker for vocal groups that engage in elaborate harmonizing, so I'm all ears when it comes to something like Handel's 'MESSIAH'. I would cast my votes in the exact order you presented the songs here: The Classically arranged choir version first, for sure, without a doubt. I do like the Oak Ridge Boys on some songs, and this wasn't bad, but it wasn't one of their best either. For one thing, I strongly disliked the way the drum was used, and in at least one place, I felt the background vocals, rather than "adding" to the piece, merely "cluttered" it up. >>... In my opinion frontman Greg X Volz is one of the greatest rock vocalists ever. I've heard of Petra before but this may have been the first time I ever heard any of their "music". If that lead vocal was fairly typical of Greg X. Volz, well... I found it nearly approaching Geddy Lee territory when it comes to "torture". Had the song been any longer, I suspect blood would have begun to ooze from my ears. When it comes to that version by Petra, for me, "hate" may not be too strong a word. So... easy, easy win for the first version performed Classically. Not that tough a choice for me. I have to go with the orchestra version. I like the traditional sound of it. I've been traveling, so I'm a little late here, although I did listen to all three versions early this morning on my phone (funny, yours was the only blog that the ole smart phone would allow to play music). Anyway...I have to agree with McCarthy on the Petra version - like nails on a chalkboard. The Oak Ridge Boys did an interesting twist and I like the vocals, but the overall arrangement was not what 'I' think this piece should sound like. Therefore, I have to go with the original. It will always be that angelic choir that I hear in my heart when the Messiah is performed. Robyn -- Kind of like "A Fifth of Beethoven" the disco remake? Denise -- The Oaks stick to the traditional classical arrangement, but the choir of voices makes the piece more heavenly. StMc -- I don't think those are real drums in the Oaks arrangement. As for the vocal clutter, as I pointed out in my response above they recreate the vocal lines as they are in the choral arrangement. With less voices there is less blend and it all sounds more harsh and chaotic. As far as Greg X Volz goes I still stand by his amazing abilities. Maybe you need to listen to more of his work. But then again maybe it's just not your style. Susan GK -- Another vote for tradition. Phil-- One more week til roast day. Faraway -- "angelic" is exactly how I picture the choir version. This is heavenly music. Yeah, I wasn't sure myself whether or not that was a drum in the Oak Ridge Boys version, so I actually listened to it a second time to find out, BEFORE posting my comment. Sounds like a drum to me, but either way, it's some sort of "percussion effect" that, to me, sounds very out of place in that song. I simply can't take "screeching vocals" - didn't like it when Janis did it; like it even less when it's a "MAN". Geddy Lee, once described as sounding like "Donald Duck after inhaling helium" gets on my nerves in under 15 seconds. The high-pitched screeching in the Petra version would have been comical to me if I didn't find it so irritating. I don't think more exposure to it is what I need, if it's all done in that manner. StMc-- I think there's a big difference between the screechy screamers like Joplin or Joe Cocker (he gets on my nerves) and the controlled power vocalists like Volz. Having listened to the body of Volz's work and having heard him in concert I'll stand by my assessment of his vocal talents. He has a phenomenal range in his voice and can sing very soothingly. What you hear in this clip is the finale of a much longer live performance of a rousing piece Petra did about praising God. If you watched the video performance in it's entirety you might think differently. I have the concert video and the live double album of the concert and I find their concert to be very uplifting as well as exciting and entertaining. I'm sure many people could listen to snippets of Bob Dylan, Tom Waits, Satchmo, Tiny Tim, or Mahalia Jackson and be very turned off by what they hear and slough the artist off as annoying to listen to. Geddy Lee? I'm not sure what he sounds like on his own or with another back-up group, but I take Rush as a whole package. I love what they do--their songs and the way they deliver them. I've only come to appreciate them in the last ten years or so, but I think they're a great band. I could come up with a number of examples of artists that I initially dismissed because I didn't recognize their true talents. Sometimes it's taken years for me to do so. I'll agree what you say about Volz's vocals -- they are awesome for that genre (and I also like Rush, but can get why Geddy might not appeal to everyone). But it's the whole spandex-clad, Spinal-Tap schtick that ruins this version for me. The Oak Ridge Boys are also very talented, but the synth-drum faux-drum arrangement is schlock. A victim of it's time, I know. If you could put these guys in some sort of a cool bluegrass acoustic version of the song, I think it would be likely be awesome. The original classical version is by far the best one, I think. You get the full range of dynamics and scale tones, the proper blend of timbre and vocal harmonies against the orchestra, and the full impact of emotional content of joy and awe, as intended.